The original version of 'Kiss me' was released in 1982. Stephen 'Tin Tin' Duffy tried to have a hit with the song two more times. First he released a remixed version in 1983 which was just as unsuccessful as the original version - even though famous remixer François Kevorkian did his work on the track - but the 1985 version was a top 5 hit in the UK. The Art of Noise-esque sound must have helped a lot. This version became a Europe-wide hit, and was played endlessly on radio and television. I didn't really want to have the single anymore after that. Now, more than two decades later, this double pack was really great to get. And I have to admit, it's great to hear 'Kiss me' again - even in the 1985 version. Stephen Anthony James Duffy was born on May 30, 1960. In 1982, he created the band Tintin with John Mulligan, Dik Davis, Andy Growcott and Bob Lamb. The band was signed with WEA Records in the UK and released the song, 'Kiss Me', which did not reach the UK singles chart. 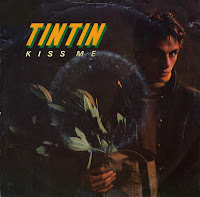 Two years later, Stephen 'Tintin' Duffy would re-record 'Kiss me' and have a hit with it in several countries. But this is the original version. I didn't know it existed when I bought it, so I was suitably surprised. I never bought the later version, but if I come across it, I will. Back in 1985, the song was played too many times on the radio so I really didn't need to have it.